Laparoscopic surgery has been widely accepted as a less invasive alternative to conventional open surgery. The fact that most contributed to reduce invasiveness of surgical procedures is reduction of the injury to the normal body wall. Since its advent, continuous effort has been made to reduce the size or number of access site to further reduce invasiveness. These approaches include needlescopic surgery, two or three port surgery, single port surgery, and NOTES. The term ‘reduced port surgery’, is collectively used for these procedures. On the other hand, the technique and instrument for endoscopic submucosal dissection (ESD) has developed to remove early cancer in the stomach and colon, mainly in Japan. Hybrid surgery is reportedly feasible in which laparoscopic surgery and endoscopic intervention is performed simultaneously. 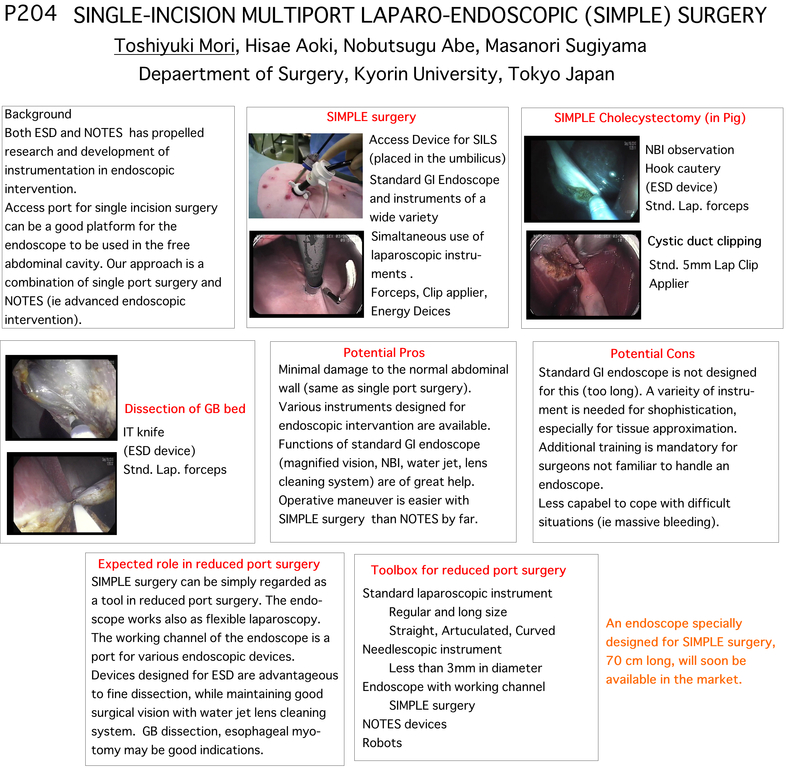 We newly devised single-incision multiport laparo-endoscopic (SIMPLE) surgery. In SIMPLE surgery, accessing ports are placed in an identical way to SPA. A digestive endoscope is inserted in the abdominal cavity through a 12mm port. Additional laparoscopic instruments including regular laparoscopic forceps, clip applier, and energy device can be inserted via a 5mm port placed next to the 12mm port. We compared SIMPLE surgery (n=8) to NOTES approach (n=4) in a porcine cholecystectomy model,to assess the feasibility and efficacy of SIMPLE surgery. All procedure in both groups is successfully completed. The SIMPLE technique required 78 min in mean for whole procedure, while NOTES approach demanded 200 min in mean. The level of technical difficulty is much less in SIMPLE surgery. Although, the device specifically designed for SIMPLE approach is mandatory, hurdle for it may be much lower when compared to NOTES. We believe that SIMPLE surgery is a good option that bridges wide gap between standard laparoscopic surgery and NOTES.